(1)P The regions of a primary seismic beam up to a distance lcr =hw (where hw denotes the depth of the beam) from an end cross-section where the beam frames into a beam-column joint, as well as from both sides of any other cross-section liable to yield in the seismic design situation, shall be considered as being critical regions. (2) In primary seismic beams supporting discontinued (cut-off) vertical elements, the regions up to a distance of 2hw on each side of the supported vertical element should be considered as being critical regions. (3)P To satisfy the local ductility requirement in the critical regions of primary seismic beams, the value of the curvature ductility factor ^ shall be at least equal to the value given in 5.2.3.4(3). (4) The requirement specified in (3)P of this subclause is deemed to be satisfied, if the following conditions are met at both flanges of the beam. a) at the compression zone reinforcement of not less than half of the reinforcement provided at the tension zone is placed, in addition to any compression reinforcement needed for the ULS verification of the beam in the seismic design situation. with the reinforcement ratios of the tension zone and compression zone, p and p', both normalised to bd, where b is the width of the compression flange of the beam. If the tension zone includes a slab, the amount of slab reinforcement parallel to the beam within the effective flange width defined in 5.4.3.1.1(3) is included in p.
a) The diameter dbw of the hoops (in millimetres) shall be not less than 6.
where dbL is the minimum longitudinal bar diameter (in millimetres); and hw the beam depth (in millimetres). c) The first hoop shall be placed not more than 50 mm from the beam end section (see Figure 5.6). 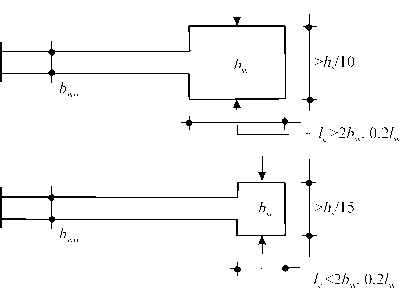 (1)P Flexural and shear resistance shall be computed in accordance with EN 1992-11:2004, using the value of the axial force from the analysis in the seismic design situation. (2) Biaxial bending may be taken into account in a simplified way by carrying out the verification separately in each direction, with the uniaxial moment of resistance reduced by 30%. (3)P In primary seismic columns the value of the normalised axial force vd shall not exceed 0,65. (1)P The total longitudinal reinforcement ratio pl shall be not less than 0,01 and not more than 0,04. 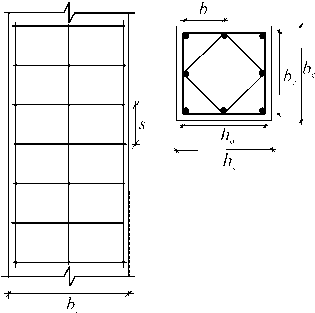 In symmetrical cross-sections symmetrical reinforcement should be provided (p = p'). (2)P At least one intermediate bar shall be provided between corner bars along each column side, to ensure the integrity of the beam-column joints. (3)P The regions up to a distance lcr from both end sections of a primary seismic column shall be considered as being critical regions. where hc is the largest cross-sectional dimension of the column (in metres); and lcl is the clear length of the column (in metres). (5)P If lc/hc<3, the entire height of the primary seismic column shall be considered as being a critical region and shall be reinforced accordingly. (6)P In the critical region at the base of primary seismic columns a value of the curvature ductility factor, should be provided, at least equal to that given in 5.2.3.4(3). (7)P If for the specified value of | a concrete strain larger than scu2=0,0035 is needed anywhere in the cross-section, compensation for the loss of resistance due to spalling of the concrete shall be achieved by means of adequate confinement of the concrete core, on the basis of the properties of confined concrete in EN 1992-1-1:2004, 3.1.9.
where n is the total number of longitudinal bars laterally engaged by hoops or cross ties; and b[ is the distance between consecutive engaged bars (see Figure 5.7; also for bo, ho, s). (9) A minimum value of ®wd equal to 0,08 should be provided within the critical region at the base of the primary seismic columns. (10)P Within the critical regions of the primary seismic columns, hoops and cross-ties, of at least 6 mm in diameter, shall be provided at a spacing such that a minimum ductility is ensured and local buckling of longitudinal bars is prevented. The hoop pattern shall be such that the cross-section benefits from the triaxial stress conditions produced by the hoops. (11) The minimum conditions of (10)P of this subclause are deemed to be satisfied if the following conditions are met. where bo (in millimetres) is the minimum dimension of the concrete core (to the centreline of the hoops); and dbL is the minimum diameter of the longitudinal bars (in millimetres). b) The distance between consecutive longitudinal bars engaged by hoops or cross-ties does not exceed 200 mm, taking into account EN 1992-1-1:2004, 9.5.3(6). (12)P The transverse reinforcement within the critical region at the base of the primary seismic columns may be determined as specified in EN 1992-1-1:2004, provided that the value of the normalised axial load in the seismic design situation is less than 0,2 and the value of the behaviour factor q used in the design does not exceed 2,0. WHAT ARE hoops in reinforcement?